Other lessons we 'enjoyed' in our years of Primary Education included things like: singing, handiwork, drawing and 'drill.' In other words: music, arts and craft and exercises in the gym hall. Music was taken by a Mr Wood from Blackburn who came a couple of times a week and tried to teach us scales and how to read music. I enjoyed the singing, but I had a hard time with the other stuff. The old piano was pushed from room to room- another job tackled by the older boys. One or two children had piano lessons outside school and so they were streets ahead of the rest of us. I may be wrong, but I think it was Mrs Wilson from Meadowhead Terrace who held these lessons. She was, for many years, the organist at the church. The craft lessons included making things like raffia mats using cardboard shapes and coloured raffia. Pom poms were made by placing two cardboard milk bottle tops together and threading wool through the hole that was meant for the straw. You kept going round and round until it was too tight to do any more. When the wool was cut between the bottle tops a loose piece was tied round the middle before the cardboard was removed and hey presto! A perfect pom pom. I remember my brother making a little woven purse in blue and white. My mother had it for years, she kept her single shillings for the metre in it. Who remembers the shilling metre...For the girls knitting and sewing were considered essential. Scarves, pockies (mittens), pull on hats and even socks were knitted in a multitude of colours with many a dropped stitch. Sewing started with simple stitching and progressed to: a knitting bag (to keep our knitting in), a lap bag (for our sewing stuff) and, in our last year, an apron and cap which would be required for cooking classes when we went up to High School. All this was in checked gingham which helped to keep our stitches in straight lines. I don't know what the boys did while the girls toiled at turning a heel or some other complicated endeavour. This page was added by Margaret Foster on 24/10/2012. We too had Mr Wood as our music teacher. When he was not at your school, he was down the road trying to put some appreciation for music into our heads. The piano was again pushed from room to room and the knitting of socks was a mystery to me at first as I thought the heel turned itself. Using four little knitting needles without ends was strange at first and the knitting bags we made were handy for carrying the masterpieces! My mother had many scarves in various colours, the pockies we knitted were ok and thank God we never graduated to gloves! Our gym was a replica of yours and Billy O'Byrne was the best in the class at gym and is still fit to this day. Your comment about hygiene is spot on and we never gave it a thought- the same with dropping a sweety on the ground we just picked it up, brushed it slightly and in it went. There were very few cases of allergies then as we built up a resistance to germs. These days we are smothered by hygiene and to little avail. Once again enjoyed your memories and look forward to the next episode. Have loved reading your personal memories and these have spurned me to write down a few of my own from the mid 1960s. I also have fond memories of gym time in St Thomas's school. We had to skip to music from a square shaped, flat wooden radio with the amplifier in the middle. During the run up to Christmas we had to practice our dancing skills. These would include, the Canadian Barn Dance, The Gay Gordons and Strip the Willow all of which were performed at our Christmas party. We all had to bring a cup and saucer for the party for our tea and cake. Just came across this site, makes wonderful reading. I used to live at 33 Meadowhead Crescent back in the 50's and 60's. Hi Ronald, I used to live at 14 Meadowhead Crescent. I remember you and your family well. I was always at your house with Joan. I was married to Gordon Kilgour who lived at 18 Meadowhead. Hope you are all well. Hi Lily. I am one of Ronald's younger brothers. People used my middle name - Paul - because it was easier to pronounce. Glad to read your note. Do you by any chance have photos of you and Joan ? I am sure I remember the Kilgours - Mary the oldest and their father Rab. Have you both moved far from Addiebrownhill ? Does anyone remember the Chmiel family who lived on Meadowhead Crescent? I lived at 37 Meadowhead Crescent and went to school with Joan. 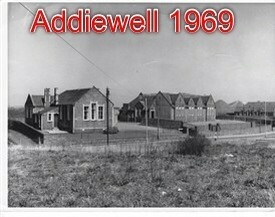 My name is Rob Mietelski and I lived on Meadowhead Crescent in Addiebrownhill from 1952 until 1960. I vaguely remember the Chmiel family but my elder sister Krysia will have a better recollection than me so I will be in touch with her to add a comment. My name was Krysia Mietelska and I lived at 43 Meadowhead Crescent from 1950 – 1960. My father was Polish (Bolek) and my mother was Scottish (Bunty or Jane), and we were quite involved with the Polish community. The Chmiel family were friends of ours and they emigrated to America, so we lost touch. The parents were Wanda and Benny and their children were Janusz, Andrzej and Elizabieta – sadly Andrzej was killed in the Vietnam War. The Tatarkowski family were parents Stan (who has died) and Irene with children Grazynia, Leszek, Zbignek and Jurek – sadly Jurek died. The Wyryslaski family – Zbignek was my dance partner at Polish Saturday School. The Mejka family – I remember that Ronald was a very good singer and I remember my many chats with his mother Jessie, who was a very interesting lady. Then there were Raymond and Joan, and I think the father was Joachim. The Kanopka family who emigrated to Canada – the father was Eddie. Other Polish families that I remember: Kaspspytski, Duda, Gorny & Szymanski. The Polish Priest was Father Bombas. I lived in Addiewell, in LIvingston St. and remember the Polish community, a few, The Tattercoskis,czechic zymanski, old Mamoushka, she was like the old motherfigure. Their concerts were fantastic, so jolly and beautiful costumes. Happy memories dancing to Jimmy Shand on the pavement. HA!I played the drums in the West Calder Pipe Band with Hughie Brown, and went on to play in the Navy bands, only girl and 100 men!!! Just came across this site tonight. My name was Margaret Scott & we lived in 58 Meadowhead Crescent. My very good pal was Joan Mejka who sadly died. Jessie her mum was a real character she really intrigued me as a child I must say. I now live in Australia but have fond memories of Addiebroonhill ?? Hi Paul Mejka I lived at 58 Meadowhead Crescent. Maiden name was Margaret Scott. I was very friendly with Joan & was very sad to hear of her passing. I live in Australia & have only discovered this site. Remember your mum well she was a character I loved her as I thought she was so different if you can understand what I mean. Hope you can read my comments on this page.